In the critically acclaimed historical fantasy Something Red, the young warrior Hob, his mentor Jack, the mystical Irish queen Molly, and her powerful granddaughter Nemain travelled far and wide, battling shapeshifters, sorceresses, warrior monks, and otherworldly knights. Now, a new type of evil has come to reside in a castle by the chilly waters of the North Sea. Men disappear and are found as horribly wizened corpses. Warriors ride out and return under a terrible spell. Only Molly, with her healing powers, can save the people from a malevolent nobleman and his beautiful, wicked wife. As all are drawn into battle, the young Hob and his adopted family must vanquish the dark powers before they themselves are defeated. An unforgettable blend of fantasy, mythology, and horror, The Wicked is just as chilling, beautifully written, and historically rich as Something Red, drawing readers into a world both magical and haunting—where nothing is ever as it seems. 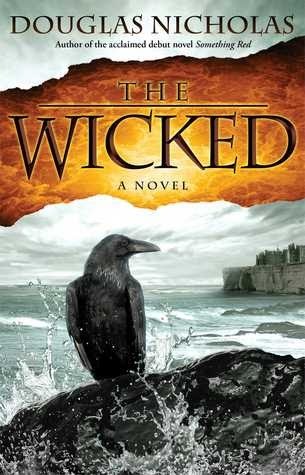 The Wicked: A Novel is set in the 1300’s and follows four unlikely heroes. Molly is an Irish Queen trying to get her realm back. We don’t know how or why she lost it, but she is enlisting the help of English Knights to help her. She and her small band of “musicians” do this by helping these Knights remove great evils from their lands. Through good magic she is able to defeat this great evil. Unfortunately throughout this book I was confused as to what was going on. There was supposed to be a big build up to the final battle against this evil. But I found it anticlimactic. By the time I had read about ¾ of the book I knew this battle wouldn’t be that great. Douglas Nicholas has tried to build tension and a great story, but unfortunately it falls flat. I don’t know if it is the over-wordiness in describing places and situations, or the hard to understand authentic dialog of the locals; but I found that if this story was cut in half you would still end up with a flat story. I found it very predictable and repetitive to other stories I’ve read before. Unfortunately a book that I thought I would love was just kind of boring. Characters who could have been wonderful and ones we could care about are actually boring. If you want to try this story, do. Just know that I will not be reading the other two books in this series. Just not my cup of tea. Douglas Nicholas is an award-winning poet whose work has appeared in numerous publications, among them *Atlanta Review, Southern Poetry Review, Sonora Review, Circumference, A Different Drummer*, and *Cumberland Review*, as well as the *South Coast Poetry Journal*, where he won a prize in that publication's Fifth Annual Poetry Contest. His other awards include second place in the 2002 Allen Ginsberg Poetry Awards from PCCC, International Merit Award in Atlanta Review's Poetry 2002 competition, finalist in the 1996 Emily Dickinson Award in Poetry competition, honorable mention in the 1992 Scottish International Open Poetry Competition, first prize in the journal *Lake Effect*'s Sixth Annual Poetry Contest, first prize in poetry in the 1990 Roberts Writing Awards, and finalist in the Roberts short fiction division. He was also recipient of an award in the 1990 International Poetry Contest sponsored by the Arvon Foundation in Lancashire, England, and a Cecil B. Hackney Literary Award for poetry from Birmingham﷓-Southern College in 1989. He is the author of SOMETHING RED, a fantasy novel set in the thirteenth century, as well as IRON ROSE, a collection of poems inspired by and set in New York City; THE OLD LANGUAGE, reflections on the company of animals; IN THE LONG-COLD FORGES OF THE EARTH, a wide-ranging collection of poems; and THE RESCUE ARTIST, poems about his wife and their long marriage. He lives in the Hudson Valley with his wife Theresa and Yorkshire terrier Tristan. Stephanie, I enjoyed your review and share your feeling that in this book there were times that you didn't know what was going on. In the recent books I've read I've come across the same problem. Sorry to hear you didn't like this one, I really enjoyed Something Red and had no idea there were going to be more in the series. I liked your interesting review of The Wicked and I am now thinking about reading it. I signed up a few weeks ago and for me their a offer a very innovative and strong core concept.